There were countless trails created from the wheels of the wagons. If the cart was too heavy to cross the water, household necessities were often left behind. Parents often died, leaving their children to fend for themselves. By the end of the era, there were at least ten people buried within every mile. 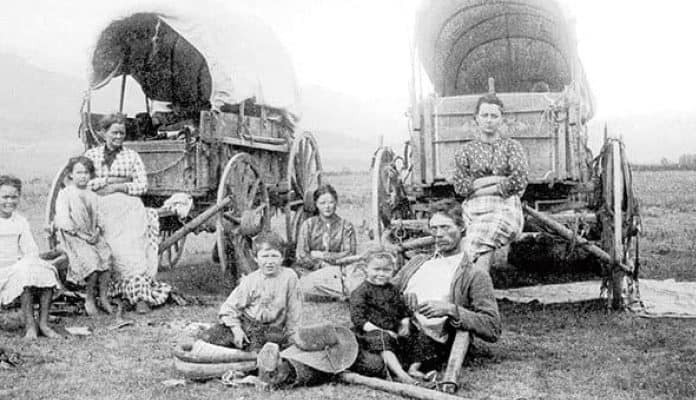 This story, fictional as it sounds, was the reality of the Oregon Trail. The location of the Louisiana Purchase over a modern USA. William Morris / Wikipedia. The Louisiana Purchase treaty was dated April 30, 1803, and signed on May 2nd. This purchase gave the United States Louisiana Territory, which doubled the size of the country. President Thomas Jefferson, Robert Livingston, and James Monroe were all astonished about the deal they made with France of the Louisiana Purchase. The territory they claimed through the sale was larger the Great Britain, Germany, Italy, France, Spain, and Portugal combined. With this purchase, America gained about 828,000 square miles of land. The final price of the total investment was $27,267,622. One problem with the Louisiana Purchase was how vague the treaty was. There were no necessary boundaries established, which did create tension over the next few years and caused another war with Great Britain. However, limits eventually developed. With the Louisiana Purchase, the land became available for settlement and exploration. However, there were not many people who wanted to venture into the unknown territory. It was not too long after the purchase that Thomas Jefferson commissioned the Lewis and Clark expedition. Jefferson wanted to know what the land consisted of and, more importantly, he tried to get people to settle there.